Silver Double Heart Necklace Just $4.99 PLUS FREE Shipping! Down From $40! You are here: Home / Great Deals / Silver Double Heart Necklace Just $4.99 PLUS FREE Shipping! Down From $40! This is the perfect sort of thing to have in your gift closet! It’s a great price, too cute, and FREE shipping! It’s a perfect gift for many occasions, even a stocking stuffer – it’s not too soon, you know! 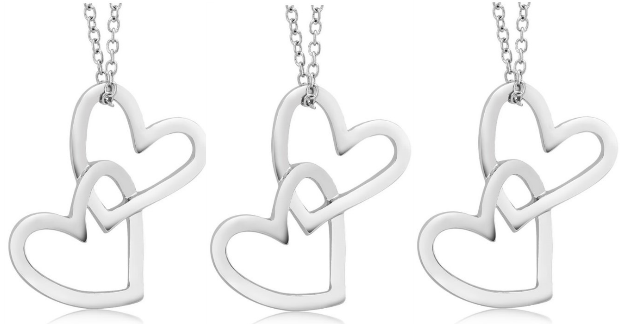 You can get this cute Silver Double Heart Necklace for just $4.99 PLUS FREE Shipping right now! It’s regularly priced at $40! This offer is good through 10/18/16 ONLY – so don’t let it pass you by! At this price you can get a few to have on hand!